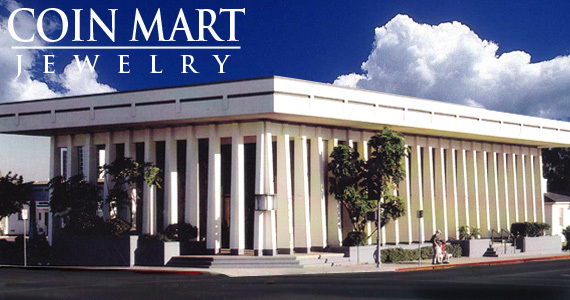 Coin Mart Jewelry was established in 1959 and has been voted The Best Locally Owned Jewelry Store in San Diego by the Union Tribune Readers Poll. We have been in business over 50 years and have over 60,000 happy customers. Visit us to see the largest selection of fine jewelry, diamonds, engagement rings and valuable coins in San Diego. If you are selling your gold or jewelry, we are the top jewelry and gold buyer in the San Diego and pay the highest prices. Come visit us today! Every store has a story of its beginnings and its progress - so does this store. The story of Coin Mart Jewelry begins with “a little red wagon”. Now picture a small boy at the age of six or seven pulling a little red wagon. This may not seem unusual but in this case the small boy had a vision and determination to create a business which took him on the path to even greater achievements. This small boy was Martin Altbaum, a man ahead of his time and the founder of Coin Mart Jewelry formally established in 1959. Marty pulled his little red wagon filled with paper comic books and traded them two for one or collected a few pennies for each one, this often put cash in his hands which he then took to his Dad’s deli on El Cajon Boulevard. While exchanging them in Dad’s cash register for larger denominations the coins with interesting dates and various conditions intrigued him and thus the love of coins began. The name, Coin Mart, was chosen as several San Diego State College students sat around a table at Denny’s suggesting Coin Marty, Marty’s Coins, Marty’s Coin Shop and finally settling on Coin Mart. As the business expanded clients began asking for coin jewelry with diamonds and precious stones to surround the coins. Thus, the store developed into a retail jewelry store and Jewelry was added to the name. The magnificence, beauty and history of diamonds next captured Marty’s attention studying them with the same passion as coins. Diamonds lead the way to studying colored semiprecious stones and pearls. The combined years of study in all the various jewelry fields, studies with the Gemological Institute of America and industry experience represented in the store by employees totals over 125 years. Today Coin Mart Jewelry’s major business is selling diamonds, precious stones, creating one of a kind jewelry pieces, and the buying and selling gold and silver. We have a large jewelry repair department and are still connected to nationwide jewelers and coin dealers. The philosophy of the store has always been quality of goods and service to its clients. Because of the loyalty of our clients, Coin Mart Jewelry celebrated its 50th year in business in 2009 at the Chula Vista location. Proclamations were presented to the store from the State of California by Governor Schwarzenegger. Other presentations were made by Congressman Bob Filner’s office, The County of San Diego by Greg Cox, The City of Chula Vista by Mayor Cheryl Cox and The Chula Vista Chamber of Commerce. Coin Mart Jewelry also was named San Diego’s Best Jewelry Store by the Union Tribune Reader’s Poll. The store is an example of a small family business which with hard work, commitment to integrity, fine business principles, strong work ethics, pride in workmanship and dedicated employees has succeeded for over 50 years. If your not already part of our over 50,000 happy customers, we invite you to join us. Our store is located at 396 E Street in Chula Vista where there is ample parking and access to nearby freeways. We want to make your shopping or selling experience fun and easy. We look forward to seeing you soon.